Joseph Dzeda, associate organ curator at Yale, offers an inside look at one of the world's largest musical instruments, the&nbsp; 12,617-pipe Newberry Memorial Organ in Woolsey Hall. The latest video of the “Treasures of Yale” series provides an inside look at one of the world’s largest musical instruments, the 12,617-pipe Newberry Memorial Organ in Woolsey Hall. Most visitors to Woolsey Hall are impressed by the stenciled pipes of the gilded main facade, but those huge golden columns are only the most visible component of the massive organ, which stretches five stories in height from the basement echo organ to the top of the Woolsey Hall proscenium. Behind the main auditorium façade lies a forest of wooden and metal pipes, ordered in rank upon rank of pipe divisions designed to emulate human choir voices, orchestral instruments, as well as a smaller division of echo pipes located under the main floor of the hall that produce ethereal resonances designed to complement the acoustics of the Hall itself. At the height of America’s Industrial Age, large organs were fashionable as the ultimate expression of complex technology, showy public structure, and hall-filling sound in the days before electronic amplification. 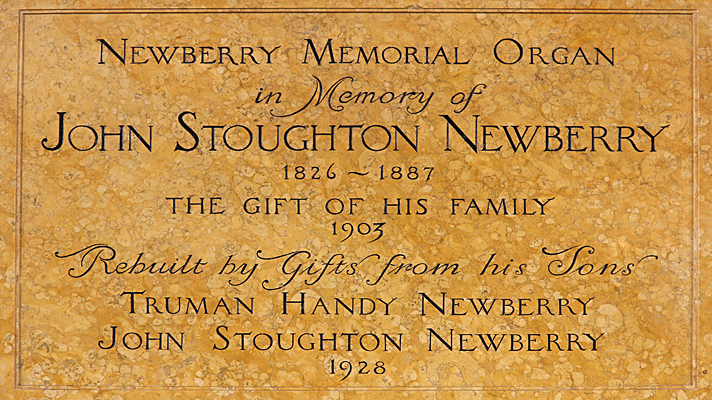 In 1901 alumnus Truman Handy Newberry was instrumental in helping University organist Harry B. Jepson secure support for building the organ from Newberry’s mother, who donated funds in memory of her husband industrialist John Stoughton Newberry, for whom the organ is named. The initial phase of construction was completed shortly before Woolsey Hall was dedicated in June 1903. 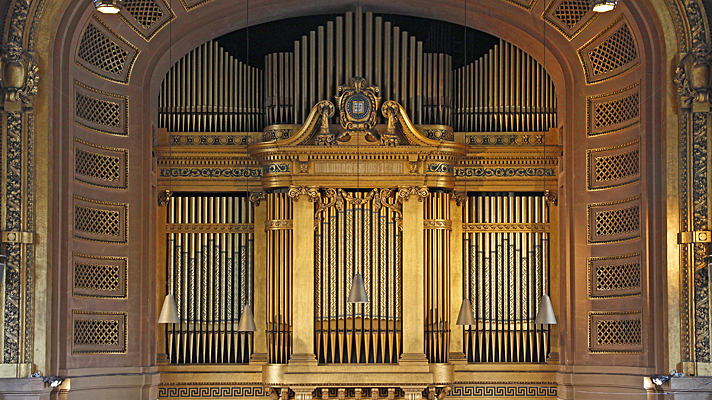 By 1915 Jepson commissioned Boston organ designer George S. Hutchings to rebuild and enlarge the organ. The Newberry was expanded once again in 1928, under the direction of organ builder Ernest M. Skinner, famed for the power, size, and musical breadth of his instruments. Today the Newberry Organ is one of the few the unmodified instruments from the golden age of American organ building. Aside from some gentle alterations to add digital controls to help automate the complex sets of stops, the Newberry is the world’s best remaining example of Skinner’s organ design. Today the Newberry Memorial Organ is world-famous, and is intensively used for practice and performance by the Yale’s organ students — often 40 or more hours per week. University organist Thomas Murray and the organ curators must guard time on the organ to limit wear and tear and to perform maintenance on the enormous instrument. Here is a slideshow offering a glimpse at the inner workings of the Newberry Organ. 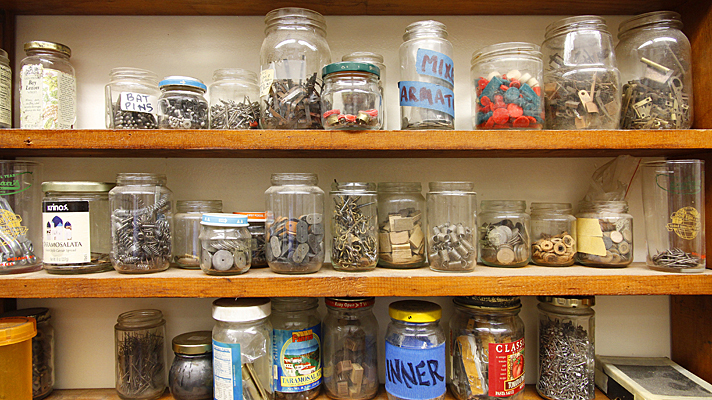 The “Treasures of Yale” is a series of short online videos that highlight unusually interesting objects from Yale’s vast collections of art, manuscripts, musical instruments, architecture, and other artifacts. In each “Treasures” video a Yale expert describes the subject, and provides background information that places the artifact in a broad historical and cultural narrative. 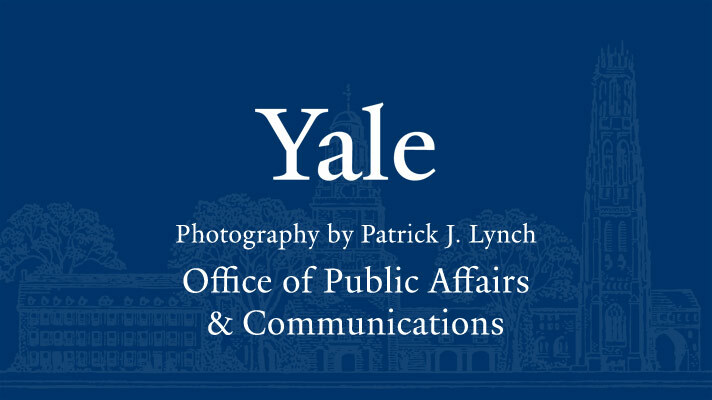 The “Treasures” videos are jointly produced by the Yale Office of Public Affairs and Communications and the Yale Broadcast Center. The videos are produced by Patrick Leone of the Broadcast Center, and the series was conceived and is curated by Robin Hogen of the Office of Public Affairs and Communications. This Newberry Memorial Organ video was directed and edited by the Broadcast Center’s Thom Stylinski.